Twitter may be experimenting with a new design, but even its new interface still leaves something to be desired. Tweenky, a new mashup that launched in private beta last week, is looking to offer Twitter users an alternative. The site sports an AJAX-heavy design that borrows heavily from Gmail (which isn’t a bad thing), and integrates a number of features that should appeal to Twitter powerusers. To get one of 200 invites, go here and enter the word “techcrunch” as the invite code. Users send new tweets from a form at the top of the page that includes integration with link-shortening sites snipurl.com and is.gd. The familiar left sidebar is broken into shortcuts, folders, and a list of hot topics taken from search.twitter.com (formerly Summize). Each folder represents a collapsible lists of keywords and Twitter users that you’ve subscribed to. The site also emulates Twitter’s Track function, which lets you keep tabs on a certain keyword over IM or SMS (Twitter used to have this feature, but disabled it earlier this year). 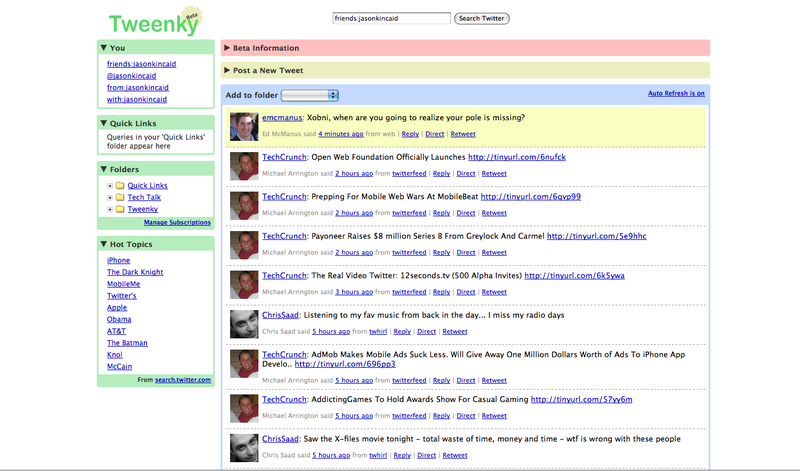 Tweenky isn’t doing anything revolutionary – all of its features are available elsewhere, either from twitter.com or TwitterSpy, which also provides Twitter’s lost tracking feature. But it brings everything together in a cohesive package that is much more intutive than most other attempts we’ve seen. For more information, check out Orli Yakuel’s introduction to the site.